It seems like a simple and obvious answer. If you want to solve the problem of homelessness, give homeless people a home. This solution is so simple, and so easy to measure, that the U.S. Department of Housing and Urban Development (HUD) has adopted this so-called “Housing First” model as its standard. But Alan Graham says the idea will never work. WORLD Magazine described Graham as a “tough old man with a big heart for sufferers.” He says, “Housing will never solve homelessness. But community will.” That’s why — in a subtle critique of the “Housing First” philosophy — Graham started the Community First Village in Austin, Texas. Community First Village opened its first homes in 2015. Today, nearly 500 people live in this 27-acre, master-planned community. Residents live in 140 specially designed “tiny houses” that each cost approximately $29,000 to build. Architects and builders have donated time, material, and expertise to help create these homes. In addition, the Village has about 100 recreational vehicles modified to serve as transitional housing. Graham and the leadership of Community First Village are careful not to over-promise. 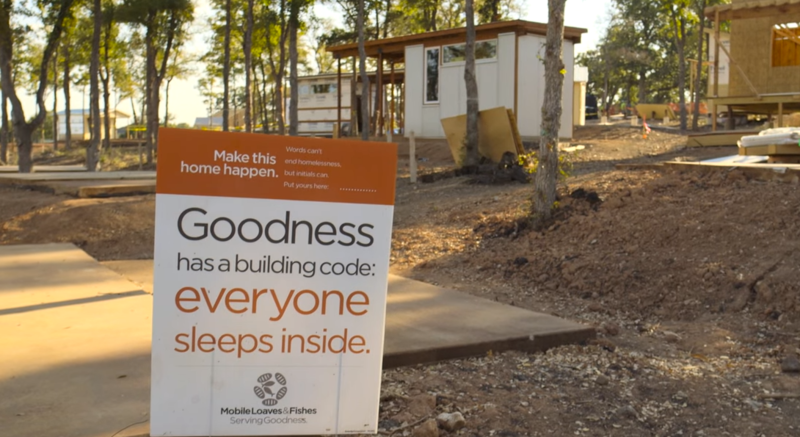 The long-term goal of Community First Village is not to eradicate homelessness in Austin, but to “mitigate” homelessness. A January 2018 study found about 2,100 people living in shelters or on the streets. That’s a large number, but a number that Community First Village believes it can address in a meaningful way. Community First Village has a simple process. First, it accepts only chronically homeless people. That leaves little doubt that any person it takes off the streets is directly impacting the homeless population. Secondly, potential residents must complete an assessment form, go through an assessment process, and learn community rules they must follow. Many potential residents opt out at this point in the process. However, those who are accepted in the program pay a modest rent ($430 per month or less) and must follow community rules. Most residents pay their rent out of government subsidies that will pay for housing. Many residents work, either at the Village or in jobs in the area. They also get a chance to participate voluntarily in a rich menu of community activities, including Bible studies and mission trips. In addition, some of the homes are reserved for “missional families,” staff members who live in the village to provide stability, hospitality, and a Christian influence. Community First’s philosophy has its limitations. It does not, for example, require its residents to take drug tests or seek employment. Residents can live there permanently. Indeed, about 15 residents have died while living there, and the community now has a small memorial garden with the cremated remains of those residents. Another barrier to expansion is cost. Altogether, the parent ministry, Mobile Loaves and Fishes, has a budget about $10-million. Total investment in the Community First Village to-date approaches $15-million. The organization is currently in the midst of a $20-million campaign to dramatically expand the Village. That’s a lot of money, but homelessness is an expensive problem for most cities, and this investment is being followed closely by other cities. To date, ministry leaders from at least 50 cities have sent representatives to Community First Village to see if what is happening in Austin can be replicated in their towns. A group of business and ministry leaders in Seattle is close to breaking ground on Agathos Community Village, modeled in part after Community First. Despite these limitations, the good work that Community First Village is doing is undeniable. Those who can get a chance to improve their job skills, those who want to get clean from drugs get opportunities to do so, and those who want to move on to a better life are given the best chance they’ve had in decades. Still Graham acknowledges that for a chronically homeless person who might have mental illness or addiction histories, even these modest goals are a stretch. Some residents have been on the streets so long, and have so many challenges, that they may never lead a fully independent, self-supporting life. “We don’t use words like ‘cured’ and ‘solved,’” Graham told WORLD. But he does use words like “love” and “respect.” The residents of Community First Village, still bear God’s image, and that means they have inherent dignity and should be treated with compassion and respect. At Community First Village, that means includes friendship, a safe home, and the opportunity to grow.